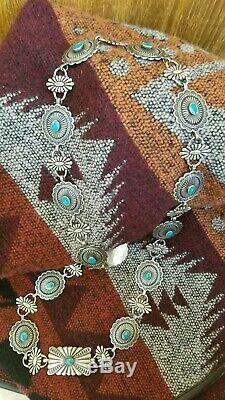 HEAVY Fred Harvey Vintage 950 Silver Cerrillos Turquoise Belt or Necklace 110g. This is an amazing belt/necklace! I have looked and researched, and haven't found a chain belt of this quality for this price! 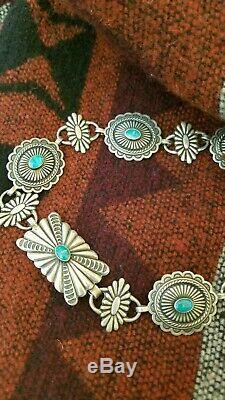 It is a very classic concho style with floral links in between and finished by a beautiful rectangular centerpiece. 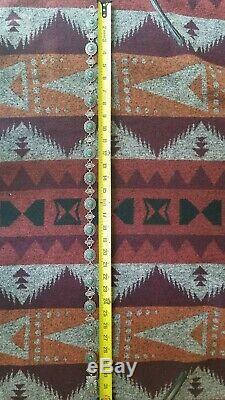 It is 31.5in long and makes a great belt or necklace! 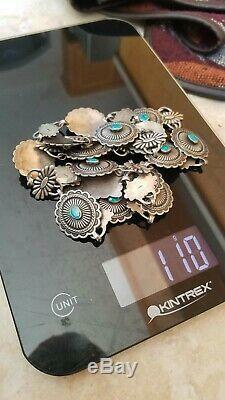 The main buckle is about 1 3/8 × 7/8in, and the conchos are about 1 × 1in. It is heavy with 110g of fine. 950 silver better than sterling! 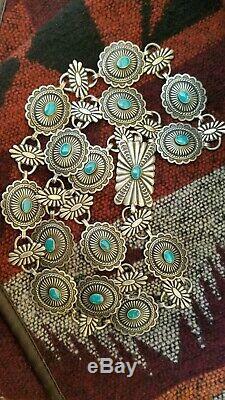 And set with perfect Cerrillos turquoise. The stones are vibrant, secure, shiny, and intact! It looks like it was never worn! There are some old pawn markings of the back. The piece is unsigned which is typical for the era. It is old -probably from around the 1930s. Check out my other Native American jewelry I have listed! The item "HEAVY Fred Harvey Vintage 950 Silver Cerrillos Turquoise Belt or Necklace 110g" is in sale since Tuesday, April 2, 2019. This item is in the category "Jewelry & Watches\Ethnic, Regional & Tribal\Native American\Necklaces & Pendants".elizabethdennis" and is located in Montgomery, Texas. This item can be shipped to United States.